Royal Estates of El Paso looked pretty good, and I liked the facilities I saw. It's the best one I've seen in my price range. The rooms looked good and have more space. I will bring my furniture over. I really liked Royal Estates of El Paso. It seemed like a very nice place. They had a lot of activities for the seniors, and the rooms were really nice. The staff seemed really good, but they took a while to get us on our tour. The food was really good. They had field trips and a music area where guests were able to play piano or whatever. They had three meals a day. It's an assisted living but somebody can go get them out of their room, check on them at night, or give them their medicine. They take them to doctors' appointments and have a beauty salon there. Royal Estates of El Paso is in a good location as there's not much traffic there. It's an open and clean community, which is more for the younger people. My friends are a little bit older, but they're happy. They also like the menus, so the food has been good. There's a bunch of activities, which is what I like about this place. Right now, one of my friends can't walk, so he really can't appreciate all of the activities that are going on. They have housekeeping, but they do their own laundry. They can schedule doctors' appointments with the shuttle service. The staff is very easy to talk to. Residents can come and go as they want. Thank you for taking the time to share your review; we appreciate your feedback and we're so pleased that your friends are enjoying their home here at Royal Estates of El Paso! Royal Estates of El Paso's pricing was out of our reach. They have an elevator, but the hallways are very confusing. The community looked nice, but it didn't have that homey-feeling. Also, we were originally quoted one price but the staff quoted us a different price. Paul, thank you for sharing your feedback! We’re sorry to hear that your experience at Royal Estates of El Paso did not live up to the expectations we strive for. It’s important to us that we make this right, so we invite you to reach out to our Executive Director at 915-260-6703 . Thank you again for your input, and we look forward to hearing from you! The best way to get to know a community is by scheduling a tour. 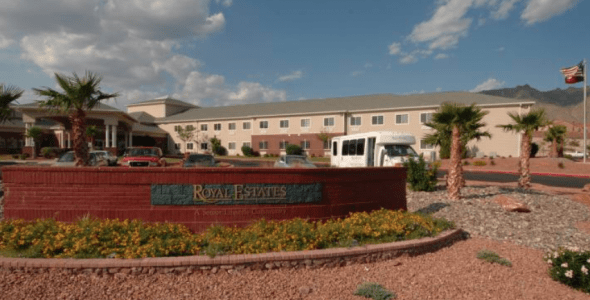 See the facilities, meet the staff and residents, and get a feel first hand what it's like to live at Royal Estates of El Paso Assisted Living. A senior living community located in the foothills of the Franklin Mountains, Royal Estates of El Paso provides both independent living and assisted living options to suit the needs of our residents. Individuals residing at our community experience a host of premium services and excellent amenities that all come together to create the retirement experience they have been looking for. Royal Estates of El Paso is operated by Senior Lifestyle Corporation. Since 1985, Senior Lifestyle Corporation has been creating premier retirement communities and innovative programs to help each senior residing with us enjoy a more fulfilling and healthy life. A variety of engaging events are held on a regular basis, and residents are encouraged to participate in the activities that interest them most. These may include group games like Wii® Bowling or bingo, local shopping trips, live entertainment and religious services. Dining at our community is quite a treat, and is encompassed by our Dining for Wellness™ program. Through the selection of fresh and seasonal ingredients, our chefs craft delicious meals that are diverse, providing residents with a number of different options to choose from each meal. We provide apartments in studio, one- and two-bedroom arrangements in a variety of floor plans. Each is equipped with an individually controlled thermostat, private bathroom and emergency call system. Some units also include full kitchens and an additional half-bath. To help ensure that time spent here is as relaxing as possible, we provide all residences with routine housekeeping and maintenance services. For reaching medical appointments or to do some local shopping, scheduled transportation is available. Here at Royal Estates of El Paso, we offer the added benefit of our Brain Health University™ program. This program encourages residents to take an active role in maintaining cognitive engagement through a variety of activities and classes, which can include physical activity, social interaction and educational lectures on topics like stress management or nutrition. Superb senior living in an inviting setting can be found right here at Royal Estates of El Paso.